Special Order Approximately 3-8 weeks if at stock at manufacturer's warehouse. Call store for details 618-233-0667. 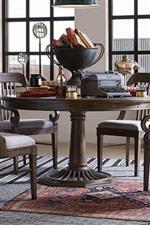 This stately dining room table set will make an impressive centerpiece in any traditional dining room. Showcasing timeless design elements, the table top is decorated with an ornate herringbone pattern and rests on elegant curving pedestals. One 23.5" leaf extends the length of the table from 84 to 107.5 inches, making the table perfect for a variety of occasions. The set comes with six slat-back side chairs and two slat-back arm chairs. 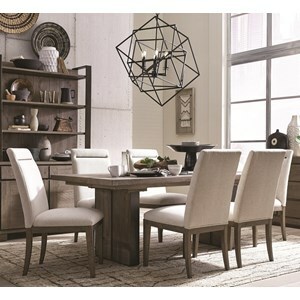 The Jefferson Market Traditional Dining Set with Six Side Chairs and Two Arm Chairs by Magnussen Home at Mueller Furniture in the Lake St. Louis, Wentzville, O'Fallon, MO, St.Charles, St.Louis Area, MO Furniture Store and Belleville, Shiloh, O'Fallon,IL area. Product availability may vary. Contact us for the most current availability on this product. Finish & Paint Options Available in two finish options. See store for details. 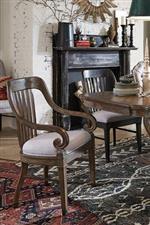 Rustic with European inspired details, this collection is just as at home in your living room as it is a French chalet. The pieces in this collection gracefully incorporate architectural details with easy-going curves, scrolled details, and turned legs. 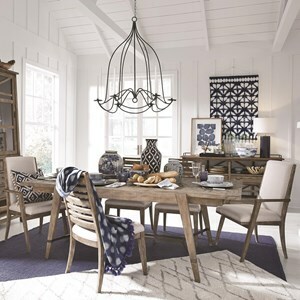 Whether you want to add some romantic charm or tie together a more eclectically styled room, this collection is sure to shine in your home. 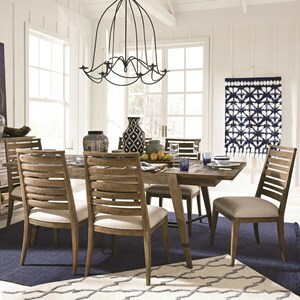 The Jefferson Market collection is a great option if you are looking for Rustic furniture in the Lake St. Louis, Wentzville, O'Fallon, MO, St.Charles, St.Louis Area, MO Furniture Store and Belleville, Shiloh, O'Fallon,IL area. 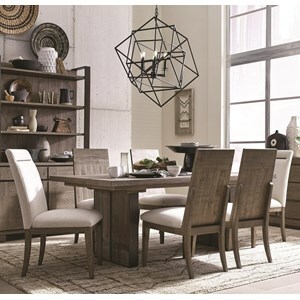 Browse other items in the Jefferson Market collection from Mueller Furniture in the Lake St. Louis, Wentzville, O'Fallon, MO, St.Charles, St.Louis Area, MO Furniture Store and Belleville, Shiloh, O'Fallon,IL area.